We see and hear the indignation of those who, in the turbid and brutal north, are attacked, sentenced, and condemned because of the color of their skin. 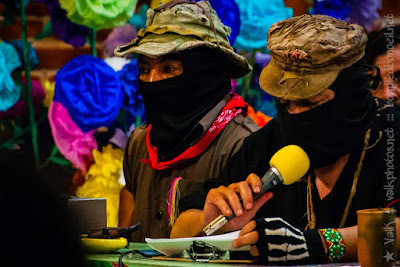 We as Zapatistas, women and men, did not trust those above before, nor do we now, nor will we ever, regardless of the color of their flag, regardless of their style of speech, regardless of their race. If one is above, it is because s/he is oppressing those below. Those above have no trustworthy word, no honor, no shame, no dignity. Earthcycles live at Crow Fair! Shame on McCain! Protest Thursday Save Oak Flat! Want to be duped? Log in at Facebook!